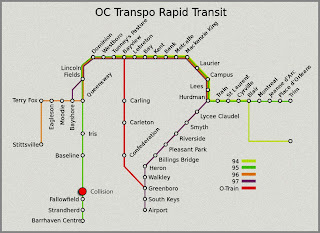 Oil-Electric: OC Transpo: Always Expect a Train! 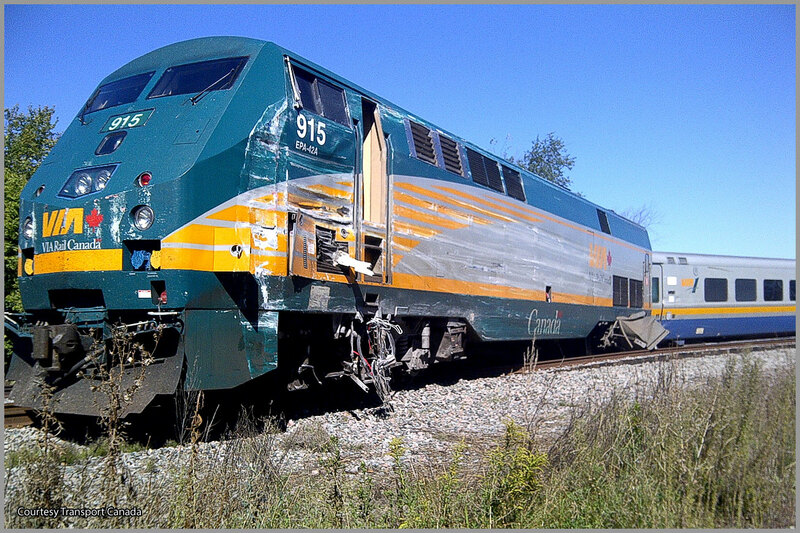 Once again we find media coverage of a train versus motor vehicle. 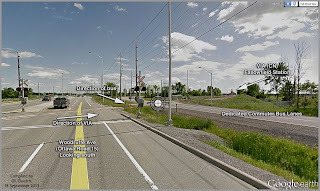 This time in Ottawa, Ontario, where a commuter bus ran through the crossing arm warning sign into the bow VIA commuter train. 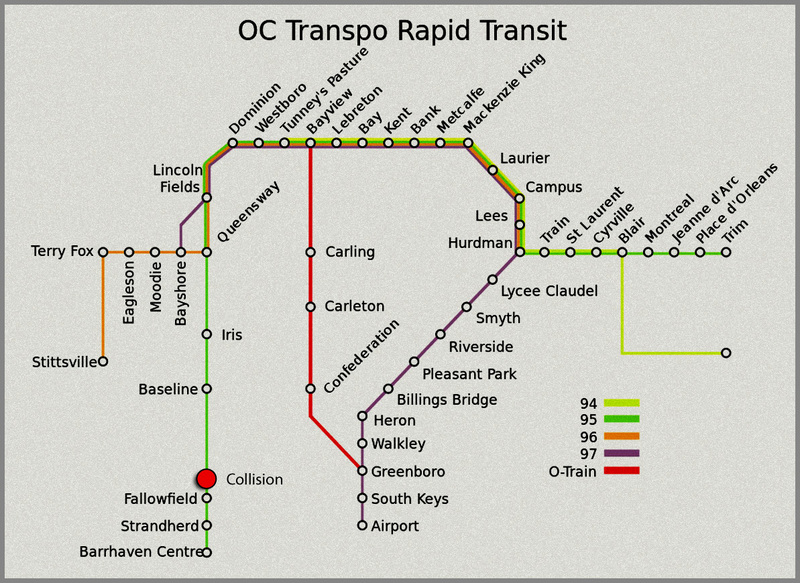 OC Transpo runs on many miles of dedicated Busways. 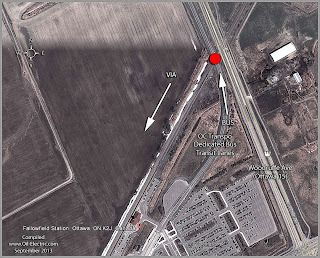 The four car VIA commuter train was slowing down on her southbound stop at Fallowfield Ontario. Inexplicably, an OC Transpo double deck commuter bus smashed through the downed crossing arm, and contacted the nose of southbound nose of VIA locomotive 915. The sound of the crash was heard by awaiting passengers, about a quarter mile south at the train station, where VIA 915 was slowing down to exchange passengers at Fallowfield Station. The net-net-net bottom line: Six dead, including the bus driver, and 30 injured. These "accidents" rile me. 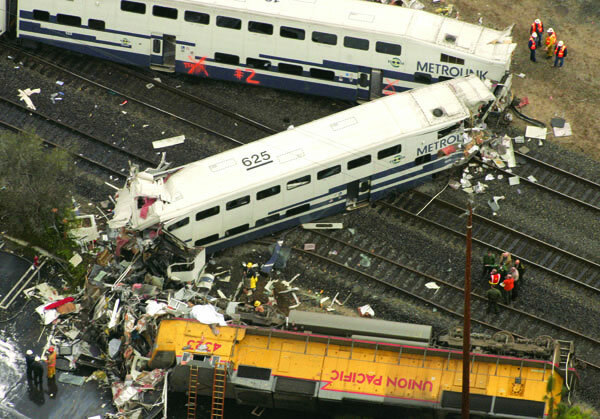 Few occurrences resulting in death and injury are "accidents." My fervent hope is, that when Transport Canada completes their investigation that we do NOT learn that the bus driver was on his cell phone texting. 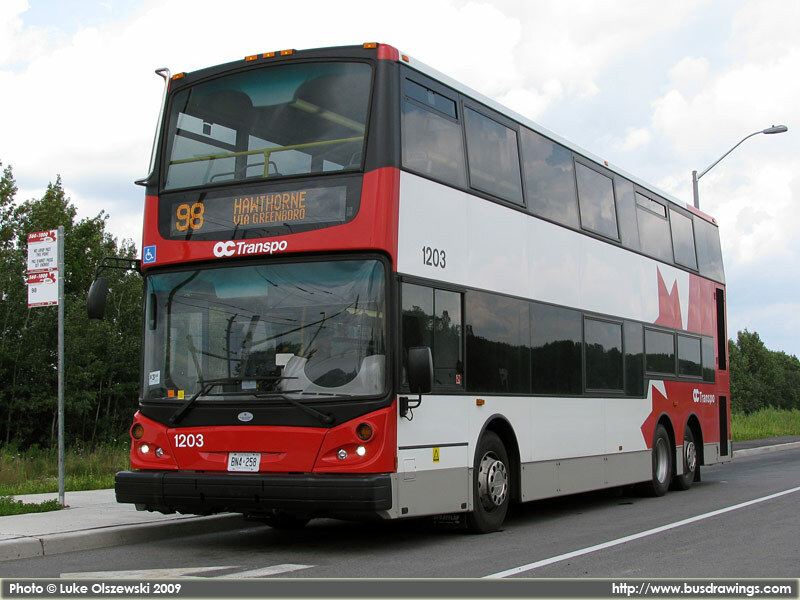 OC Transpo purchased 3 Enviro500s for further testing, after two trials in 2006/2007. The first unit arrived in November 2008 and the city of Ottawa operated them on a variety of routes. These three demo buses were sold to BC Transit in the summer of 2012. 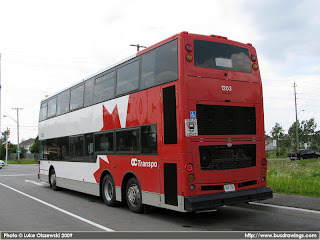 In North America, the Enviro500 was unveiled at Expo 2008 in San Diego. In October 2008, an agreement was sealed with ElDorado National which will assemble the Enviro500 at the ElDorado National plant in Canyon Lake - Riverside - California. We just have just completed a study here in Washington State that revealed driver use of electronic devices. University of Washington investigators saw that more than 8 percent of drivers were engaging with such devices behind the wheel, higher than previously estimated. Among those driving distracted, nearly half (45 percent) were observed texting. The study looked at the behaviors of 7,800 drivers in six counties. Using randomized observations at controlled intersections, investigators recorded drivers engaged in a range of distracting activities, including texting and talking on the phone. Researchers found that the most common source of distraction was a hand-held device, such as a cell phone. Among the 3.4 percent of drivers who were talking on a hand-held phone, half were holding the device near or under the steering wheel. This risky behavior diverts the driver's attention from the road. 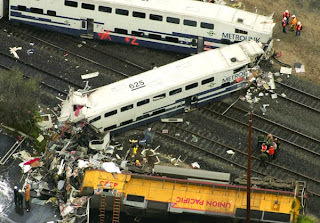 Like the engineer of the commuter train in Chatsworth California who drove his commuter train into a southbound Union Pacific freighter, killing 25, including himself, and injuring 135. Railroad Stuff: The Locomotive: CN 915 is a GE P42DC rated at 4250 hp, 3170 kW riding on 4 wheel trucks. She is geared for 110 mph running but is restricted to 100 mph by VIA. General Electric built it in late 2001 (serial number 53230). General Electric Genesis (officially trademarked GENESIS) is a series of passenger locomotives produced by GE Transportation Systems, a subsidiary of General Electric. Between 1992 and 2001, 321 units were built for Amtrak, Metro-North, and Via Rail. 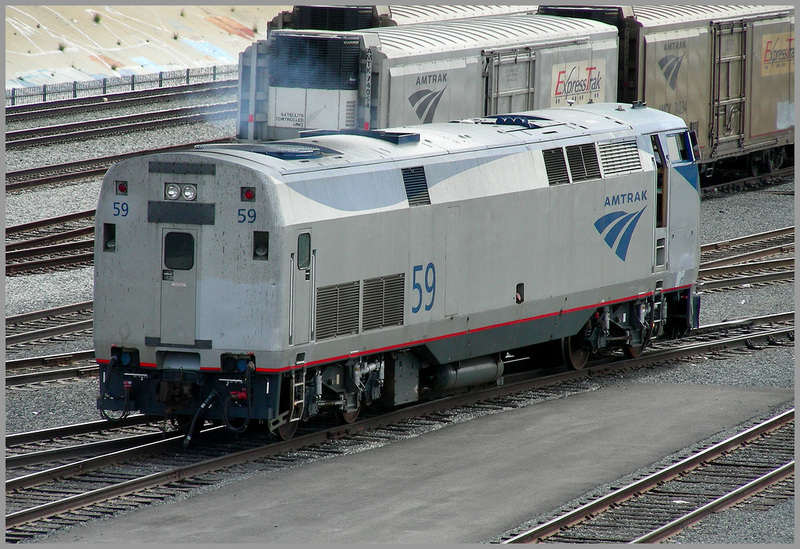 General Electric designed the Genesis series of locomotives in response to a specification published by Amtrak and ultimately selected over a competing design presented by GM EMD. The Genesis series are unique among current North American diesel-electric locomotives because of their low height. This height restriction allows the locomotive to travel easily through low-profile tunnels in the Northeast Corridor. The Genesis series is lower than even the previous-generation F40PH by 14 inches (356 mm), and is the only Amtrak diesel locomotive that meets the clearance requirements on every Amtrak route. A majority of Amtrak's trains are powered by at least one Genesis unit. The Bus: The Enviro500 double decker buses are powered by an ISL 330HP Cummings Diesel with EGR (exhaust gas recirculation,) SCR (Selective Catalytic Reduction,) which conforms to EPA10 standards. The Cardinal Rule is: When Approaching a crossing, "ALWAYS expect a train!" 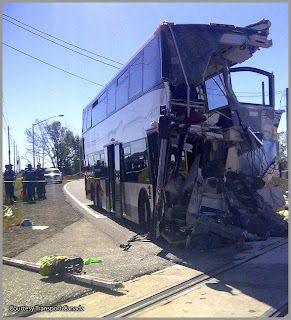 It looks like human error/inattention on the part of the bus driver - solely my opinion. Truly tragic. 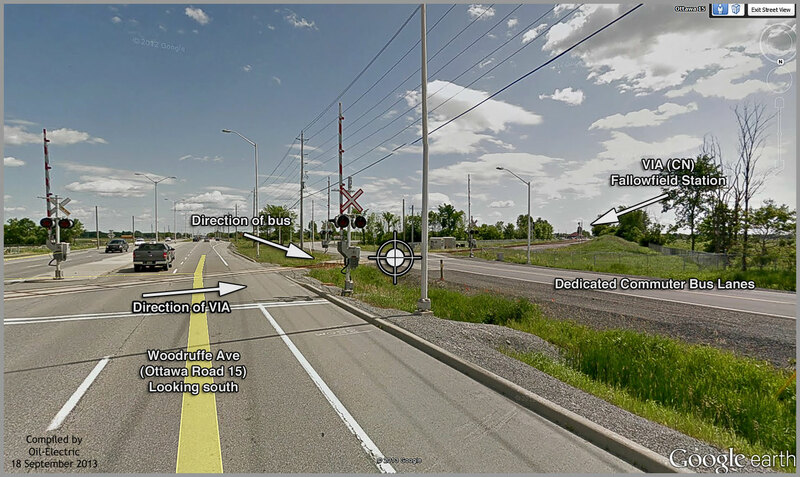 VIA 915 was rebuilt after a previous fatal accident involving a truck in Glencoe, Ontario in the summer of 2011. Check out some of the photos that show 915 straddling the main and siding tracks at Fallowfield. A professional driver of motor vehicles has my utmost respect. I know several. They concentrate on driving. Only. If that individual was not concentrating solely on driving his/her bus, it riles me. If texting and distraction was involved, I do not know a solution, other than a ZERO tolerance policy in every case. And I mean losing one's license for any infraction. Accident, or no accident. I enjoy your blog. Please do not forget Part 2 of the Palouse and WSU. Greetings from Port Townsend, Rod. There are TWO more installments on the Palouse. Current events keep bumping my efforts. 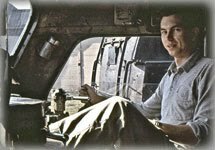 As a Septuagenarian, I am supposed to be "retired!" I am distressed that you are a Husky fan. But there is a regime of shots that can cure that - make you appreciate Cougars. The comment about professional drivers concentrating on driving only. Transit bus operators do not have this luxury what with having forced interaction with passengers. Hope the driver had a seizure or something similarly unexpected. Would be unforgivable if he killed and injured his innocent passengers over something preventable: drugs, daydreaming, texting, or cell phone use.